Nothing quite has the ability of complimenting homes than marble columns. Home owners in regions such as Los Angeles, California and New York should capitalize on these in order to increase the appeal and value of their homes. Marvelous Marble Design Inc. is the company behind provision of these quality columns and they provide a variety of options for you to choose from. Top on the list of marble columns is Corinthian. This provides a variety of design options to choose from such as the 2 color columns, stone columns on stairs, white marble Corinthian columns and 12 ft limestone columns. Alternatively, if you live New York you can also opt for the Ionic marble columns and in this case, you have the chance of making your choice from the 10 foot marble columns, the spiral limestone columns and the marble ionic columns in the kitchen. 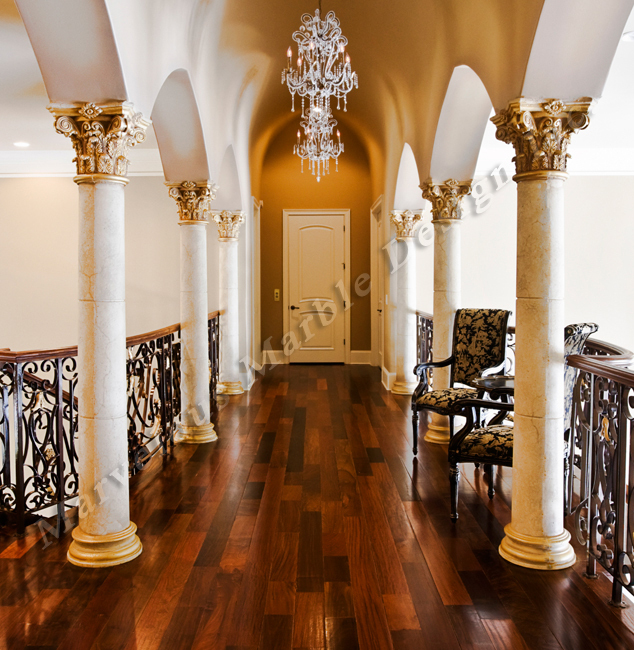 Those who love the Doric Marble design also have a variety of options to choose from starting from the Cast Stone Doric columns to the Limestone columns in round rotunda, Caststone columns in Hallway and Cast limestone in bathroom. Regardless of the marble columns you choose, you can rest assured that they are going to be of the highest possible quality and what is more, they will make your California, Los Angeles home stand out in a superb manner. Pilaster is another option for people looking for unique marble columns and in this case, there are also a couple of options to choose from. In this respect, there is the 10ft Windows pilaster, interior limestone door surrounds, 9 ft marble pilaster, new design limestone columns and limestone pilaster and wall panels. With these designs, you can always rest assured of getting quality work completed with the agreed timeframe because Marvelous Marble Design Inc. is dedicated towards ensuring that customer needs and requirements are met. Posted 6 years, 7 months ago at 4:50 pm.